Here’s an update on what I’m doing in the next few months …. Now is a really excellent time to enrol in one (or more) of my classes! These will be held at the Sherwood Neighbourhood Centre, 38 Thallon Street, Sherwood (it's quite close to the train station). 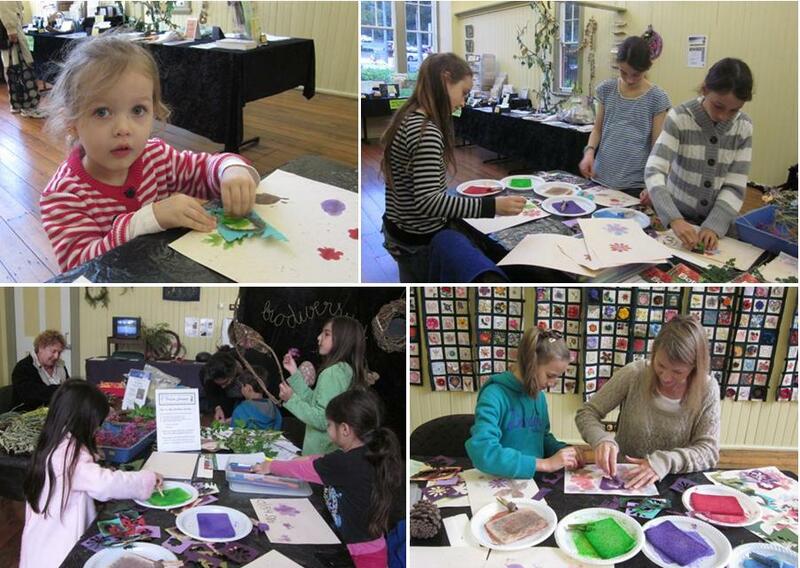 The classes run from 2pm until 6pm on Saturday afternoons. In these classes you will be shown many different techniques for making your own books. These are great for storing your photos and memorabilia or for recording your thoughts. 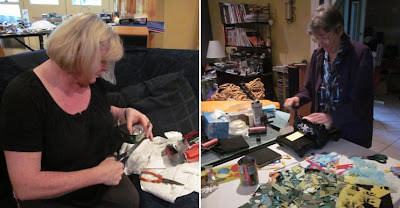 You will be able to see (and handle) hundreds of Tricia’s books showing lots of different variations, and make samples of those that appeal to you. These classes are suitable for complete beginners as well as those who want to learn new techniques. You can come to both days, or just one. 11 August: single-sheet books, concertina books, flag books, tunnel books, origami books. 18 August: books with folded covers, pamphlet stitching, exposed bindings & Japanese stab-bindings. Learn to write basic Italic and Roman letterforms. These versatile and elegant lettering styles are perfect for writing poems, certificates and invitations, and for adding a special touch to your journals and artist books. You will experiment with a wide variety of calligraphy tools, and learn spacing techniques, interesting variations and flourishing, and the characteristics of many other different scripts. This class is suitable for complete beginners as well as those wishing to refine their calligraphy skills. 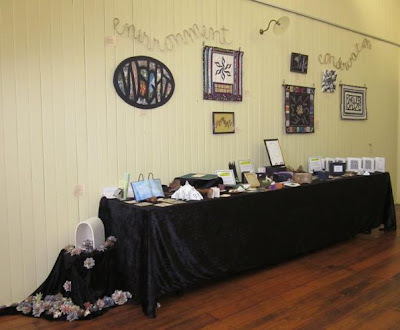 I am a registered teacher (BA, BSc, Grad Dip Art Ed), and I have been teaching Calligraphy and Paper Crafts in TAFE colleges, community venues, primary schools and high schools for over twenty-five years. My work has been exhibited, published and sold in Queensland, interstate and overseas. 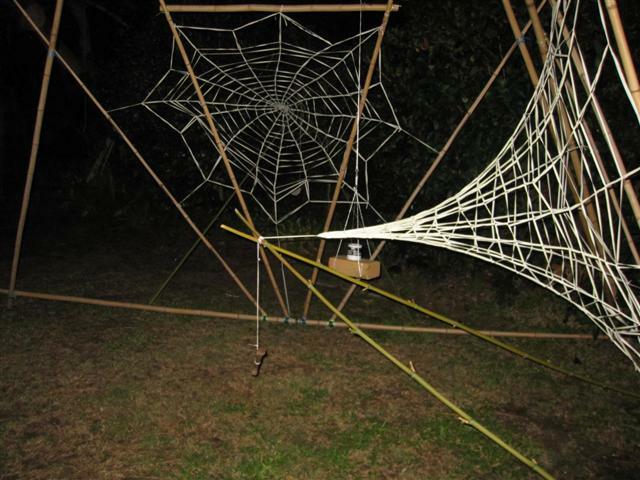 ARACHNID ARTISTRY – a different type of website! 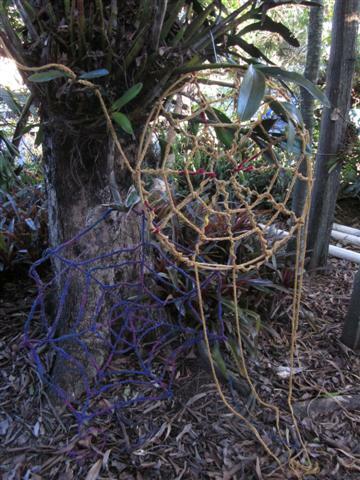 My friends have been helping me construct webs which we will be hanging in the trees at the Gardens. These webs have been created in multiple shapes, materials and colours, and they will be suspended in the trees in the 'forest island' near the entrance to the Gardens. 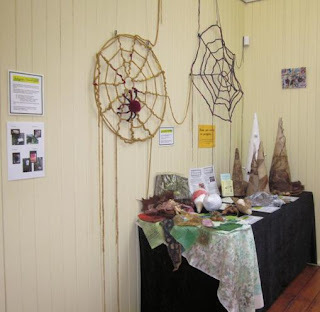 It is a real privilege to have webs created by special guest artist is Jude Skeers, internationally-recognised ‘knitter extraordinaire’ and ‘web-master’. 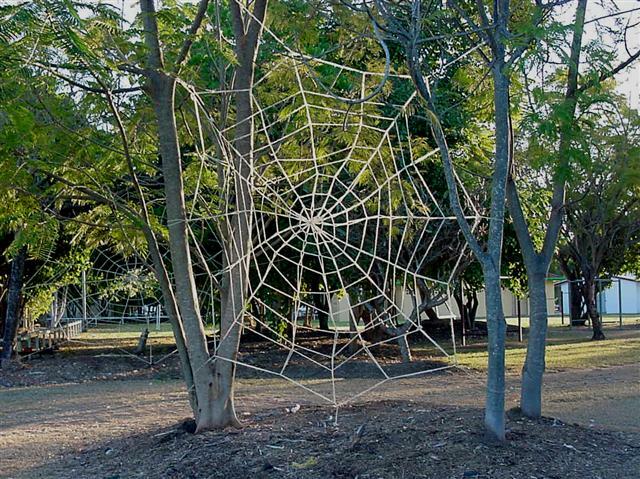 His stunning sequinned webs will be a real highlight in the trees! 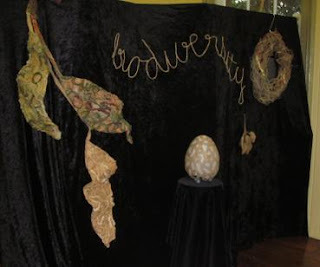 Jude will also collaborate with Peter Wojciechowski, bamboo artist, to create amazing sculptural installations. Please come and see them, and join in the fun at the Gardens on Saturday & Sunday 4 and 5 August. 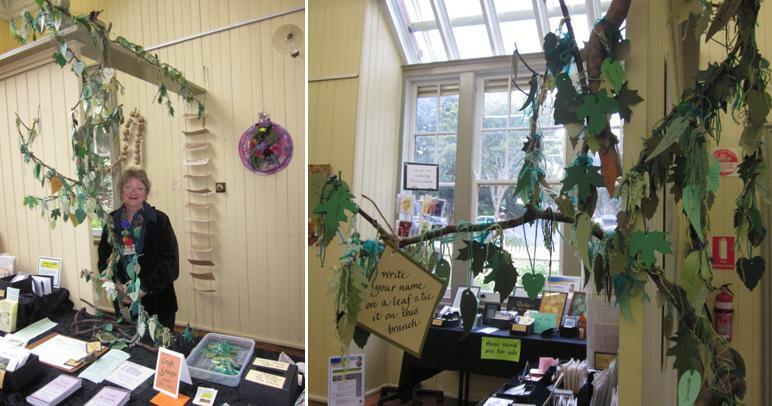 From 10am until 3pm there will be tables set up on the Auditorium lawn, and we’ll be writing messages and threading them through netting in the trees to create a community web. Tell your family and friends – it’s a free activity for all ages. 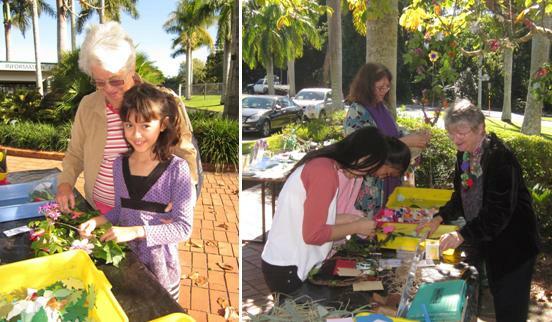 There are lots of activities planned for the Japanese Cultural Day on Sunday, 19 August. 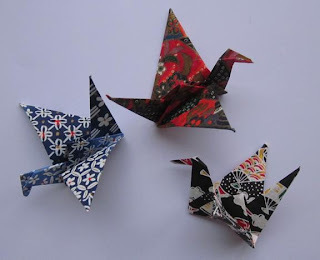 I’ll be helping people make origami paper cranes, and there will also be ikebana (flower arranging) demonstrations, a tea ceremony, mochitsuki (rice cake making) and Japanese music. This all happens in the Japanese Garden from 11am until 3pm. I have also planned other free activities in the Japanese Garden during the following week, from 10am until 3pm on Friday 24 August, Saturday 25 August and Sunday 26 August. 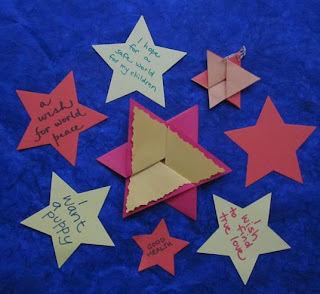 As well as making more origami paper cranes, we will be writing wishes on stars as part of the Tanabata Festival. Please come and join me. I'll be announcing details of my next collaborative projects soon ... and I'm hoping people from all over the world will participate in these! 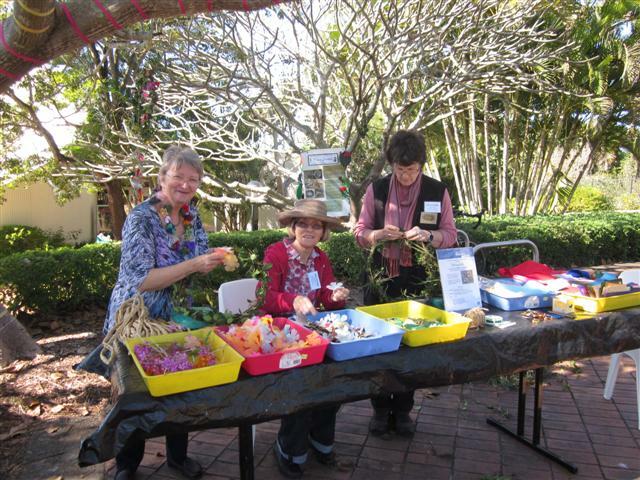 Members of the public joined me in celebrating the Winter Solstice at the Gardens. Throughout human history, the shortest day of the year has had vital significance for people from many different cultures. This has been acknowledged in various ceremonies and traditions. Following the shortest day (and longest night), we can then look forward to the blossoming of new growth in the Spring. Wreaths are a symbol of continuity and the cycle of life, so, by making wreaths, we were celebrating the progression of the seasons. Felicity Clarke had helped me cut flower and leaf shapes from aluminium cans, felt and Lutrador. On 16, 17, 18, 23 and 24 June, visitors to the Gardens joined me making wreaths. On the first weekend Jill Brose and Joanne Jayne helped me set up the tables and we started twining bamboo, ivy and creeping vines into circles. 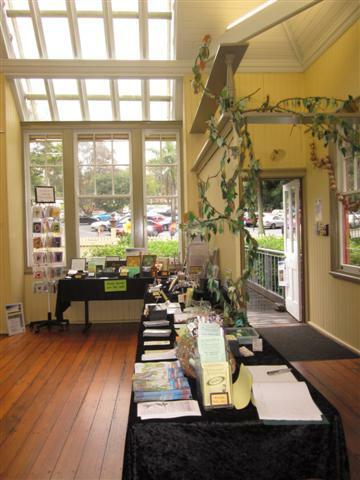 Fortunately we had a lovely fine day, and a prominent position near the Visitors Information Kiosk. 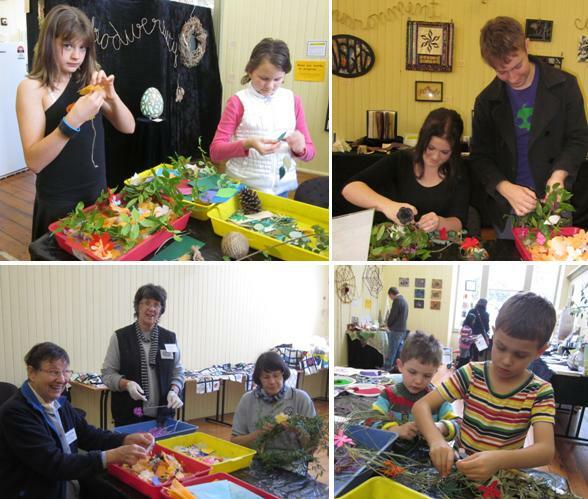 Lots of people, both young and old, really enjoyed creating masterpieces. This turned out to be very fortuitous because the weather all week was dreadful - very cold and raining most of the time - so being out in the open would have been disastrous! 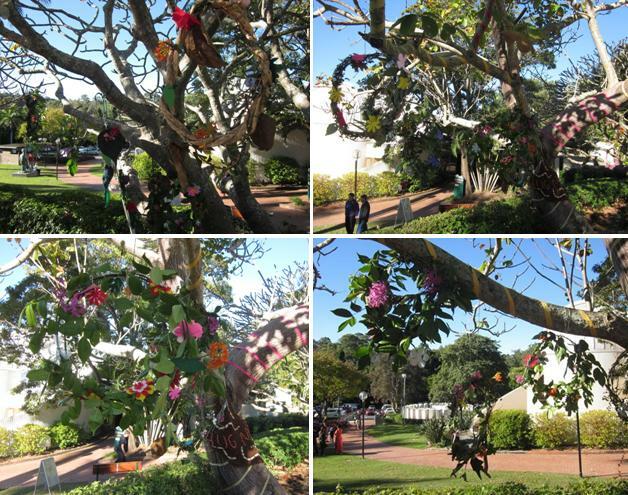 We hung the completed wreaths in the Shaving Brush tree (near the Visitors Information Kiosk) where they remained for a few weeks, and were greatly admired by all. 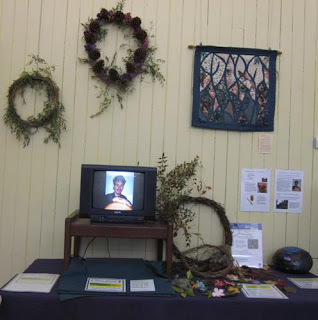 I also planned another activity for visitors to the Gardens. On the actual night of the Winter Solstice (21 June) we made decorative covers for candles. Candles, signifying the shedding of light in the darkness (and the start of longer day-lengths) are an important symbol in many cultures. We set up tables under the Shaving Brush Tree (Pseudobombax ellipticum) and we had fun punching shapes out of paper strips to decorate tea-light candles. They created a magical atmosphere as the sun set. This activity was a prelude to some amazing singing by the Deep Sea Divas. This was part of “Fete de la Musique”, and apparently there were other performances throughout Brisbane (and indeed all over the world) on this night of the Winter Solstice. Frances Blines, the hard-working team-leader of the Volunteer Guides at the Gardens (and also one of the talented Divas) had made some yummy roasted potatoes and mulled wine. It was a shame that we didn’t have too many visitors on the night to help us eat it – but that left all the more for us! Because the Shaving Brush Tree is deciduous, I wrapped it in a blanket to keep it warm during winter! Old-style closely-fitting jumpers called "Hug-me-tights" are now making a fashion comeback. This one is hand-knitted in brown rope, with the words HUG ME TIGHT crocheted in orange cotton. Words of wisdom for Tree Hugger conservationists are hand-lettered on calico and threaded through the knitted mesh. 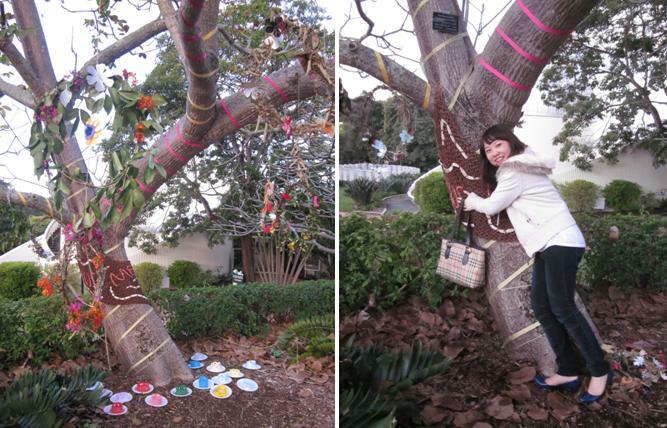 It was so nice to see some visitors to the gardens spontaneously walking up to the tree to give it a hug! I originally made this tree-blanket for the Warwick Jumpers & Jazz Festival several years ago, and it’s great for it to have another public outing! … and if you haven’t yet made an annual pilgrimage to see hundreds of trees clothed for winter in Palmerin, Grafton and Fitzroy Streets in Warwick then you are missing a treat. The Warwick Jumpers & Jazz Festival is on this year until 29 July…. and while you’re there, check out the amazing “Taking Leaf of My Senses” exhibition at Warwick Art Gallery (10am – 4pm daily) by talented, internationally-acclaimed artist Sue Dennis. 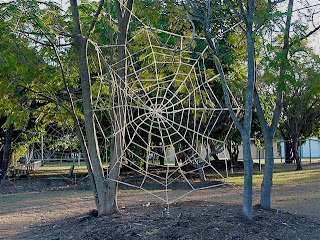 Look out for my next 'public performance' at the Gardens ... webs will be hanging in the trees in early August ... more details soon! Despite a week of very cold and wet weather, lots of stalwart friends visited my mid-year exhibition, celebrating the progress of my residency to date, and showcasing some of my previous work. I really enjoyed talking to all my visitors ... telling everyone about what I've done so far, and what I still hope to achieve. 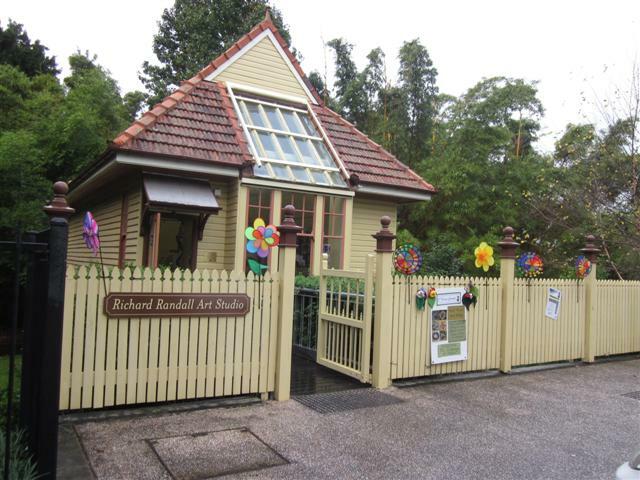 The venue was the heritage-listed Richard Randall Art Studio, located close to the entrance to the Gardens at Mt Coot-tha (near the Cafe). It's a lovely building, but it's like an icebox in wet weather in winter! My dear friends Wendy Sonnenberg and Jill Brose did an amazing job setting everything up so tastefully for me. I couldn't have done it without their design expertise and physical support. 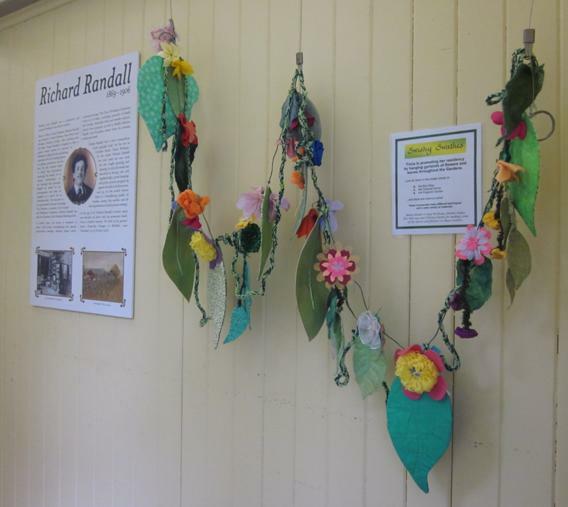 The "Flowers of Friendship" hangings (described in my previous post) were the main feature of the exhibition. It was wonderful that so many people who had participated in this project braved the awful weather to come along to see them. 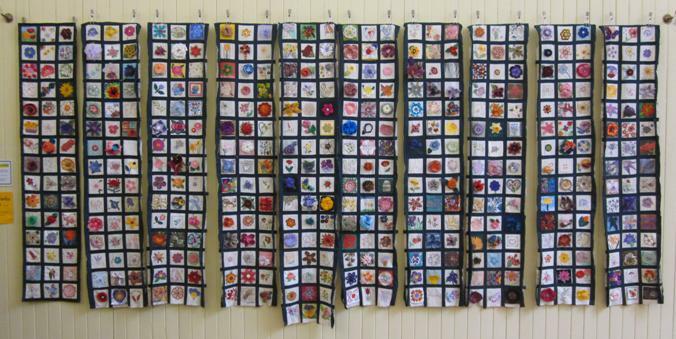 All the flower squares were sewn together, but unfortunately I didn't have time to finish the hangings completely ... but this proved to have an unforeseen bonus, because I received some more squares during the exhibition, which can now be added in ... and some people said they would still like to make one. So, even though I originally asked for them to be sent to me by the end of April, you can still participate .... but I really do need them ASAP! 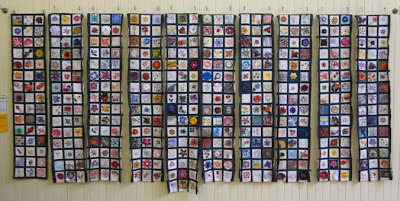 I faithfully promise to have the finished hangings on display at my final exhibition (6-14 November). My nephew, percussionist Matthew Horsley, composed and recorded a soundtrack for me entitled "Other Voices" and the croaking of pobblebonk frogs and other natural sounds created wonderful atmosphere for my exhibition. This was accompanied by a slide-show of images featuring some of the activities I have organised for the public during the year, and also showing the progress of my collaborative projects (some completed, some 'on-the-go' and some still in the planning stages). Along one wall some of my previous work (mostly with a nature theme) was displayed. Anyone who knows me well won't be surprised to know that ALL these pieces incorporated words in some way or another! 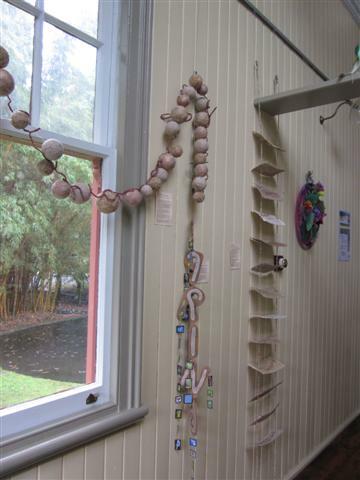 I was gratified that many of my visitors took time to read the explanatory notes which described each piece. Tangled Nature (with QSWFA Book & Paper Group) - black pen and graphite pencil doodles inspired by leaves and flowers. Bookswap (various book artists) - people made books with a "Plants" theme. In another area I set up some of my merchandise to sell. These small books, fridge magnets and bookmarks proved to be ideal gifts for tourists to take home! See the leafy tree in the photo above? This represents some of the people who have visited me during my residency year so far, and chosen to write their name on a paper leaf. Hopefully by November the tree will have grown into a huge forest giant! On one wall and a table I displayed some of the collaborative works in progress that will be finished for November. Integrate/Disintegrate (with the 'Broadstrokes' artists) - bundles of assorted fibres are hanging in a tree at the gardens, and also in trees and buried in our home gardens. 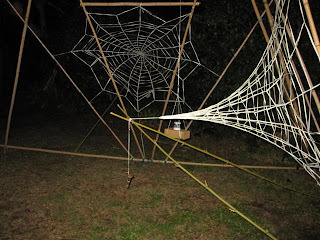 Arachnid Artistry (with Jude Skeers, Peter Wojciechowski, Annette Waraker and other fibre artists) - webs will be constructed in trees in the gardens on 4 and 5 August (accompanied by activities for the public to join). Forest Collage (with Lyn Baxter and Sue Ford) - a mixed media collage hanging incorporating felting, painting, handmade paper, materials and techniques. 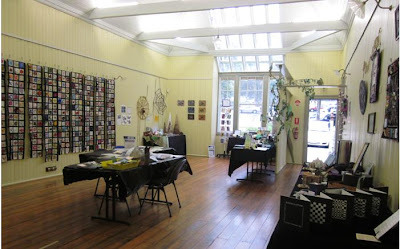 These include wet felting, embroidery, painting, machine embellishing, crochet, knitting and many other techniques and materials. Pods (with Jill Brose) - basketry techniques and handmade papers will be used to create seedpods, insect cases and other natural receptacles. The Water Dragon story (with my sister Alison Horsley) - a short children’s story about a water dragon living in the Gardens ... 2012 is the Chinese Year of the Dragon, and also the Year of Water. Naturally inSPIREd (with QSWFA Pulp Action Group) - cones constructed from plant-fibre paper, embellished with a variety of plant materials and found objects. 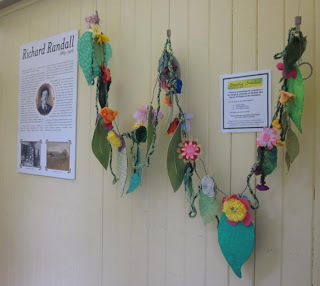 At the front door I displayed a sample of my Swishy Swathes - garlands of flowers and leaves which are hanging in the shelter sheds at the Bus Stop, the Tropical Dome and the Fragrant Garden … and there are more to come! 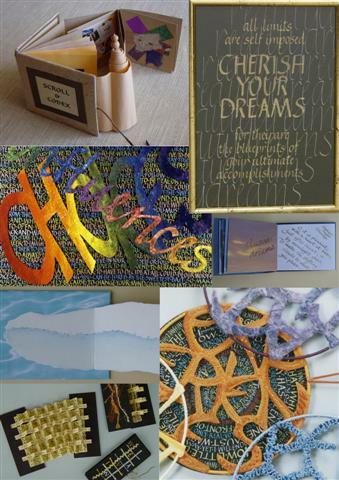 These incorporate many different techniques and a wide variety of materials. Gay McEwan, Joanne Jayne, Tess Murray and Felicity Clarke made some of the leaves and flowers in these swathes. Some of my hangings festoooned the other side of the doorway. We camouflaged the kitchen area with a screen ... which gave me yet another chance to display more of my previous work! Throughout the exhibition there was a chance for children (and adults) to stencil images of leaves and flowers on paper ... and there is always the possibility for this to become a future feature artwork! So, there you have it ... a virtual tour of my exhibition ... thanks for reading this far! I hope you'll come and see the final results of my residency in November.... and read my next blog post for details of how to join my other collaborative projects.